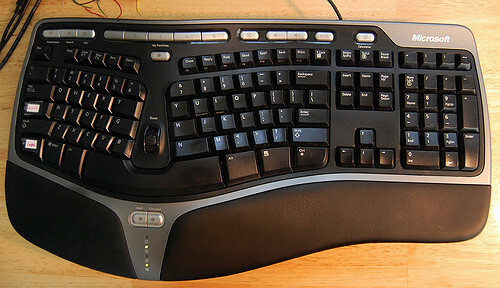 Keyboards that are too high or too low can cause an awkward bend on the wrists, arms, or shoulders. Typing in these awkward postures can result in hand, wrist, and shoulder discomfort or injury. • Adjust the chair height and distance from the desk to maintain a neutral, relaxed body posture. Elbows should be about the same height as the keyboard and hang comfortably to the side of the body. Shoulders and wrists should be relaxed, and not be up or down while typing. • A keyboard tray may be needed if the work surface or chair cannot be properly adjusted. The keyboard tray should be adjustable in height and tilt, and provide adequate leg and foot clearance. • The keyboard’s vertical position should be maintained within the recommended range shown in Figure 2. The tilt of the keyboard may need to be raised or lowered using the keyboard feet to maintain straight, neutral wrist postures while accommodating changes in arm angles. A keyboard that is too close or too far away may cause an awkward forward bend, resulting in muscle fatigue in your lower back, upper back, and shoulders. Set the keyboard directly in front of you close enough so your elbows stay near your body and your forearms parallel with the floor. The keyboard tilt, caused by extending the legs on the back of the keyboard or by a steep design angle, may cause the wrist to bend upward, resulting in wrist strain. Smaller laptop keyboards may also contribute to wrist strain and fatigue. These awkward wrist postures can create contact stress to the tendons that move within the wrist during repetitive typing. • Reduce wrist angles by lowering or raising the keyboard or chair to achieve a neutral wrist posture. • Elevate the back or front of keyboards to achieve a neutral wrist posture. Do not use keyboard legs if they increase bending of the wrist. • Consider using keyboards with a split keyboard design, as to add more comfort and neutral posture for each hand and wrist while typing.